Jannine Jennky was a French driver who won the 1928 Grand Prix de Bourgogne. She purchased a brand-new Bugatti T35C in 1927 and registered it for competition. During her short career, she would almost always drive a Bugatti. Her route into motorsport is rather obscure. In the early 1920s, she was a musical comedy singer based in Paris. It is possible that she took part in the races for actors and performers (“Championnat des Artistes”) popular at the time, or even just watched them and was inspired. In a 1928 interview, she did not elaborate on the way she got started, but said that she had always loved speed and danger. She first appears on the entry lists in 1926, driving a Chenard & Walcker in the Paris-La Baule women’s rally. Her first event with her new Bugatti seems to have been a hillclimb at Chateloup, in June 1927. She quickly became part of the women’s racing “scene” that grew up around Montlhéry in the late 1920s. Not long after the Chateloup event, she raced at the first Journée Féminine de l’Automobile, reaching the final of the racing championship. In August 1927, she took part in the women’s race held at the track, as part of the Paris 24 Hours. She was fifth on handicap, in front of Elisabeth Junek, who was also in a Bugatti. Her first major result was a third place in the 1927 Grand Prix de la Baule, an international race in France. She was only a second behind her nearest rival, Michel Casse, who was driving a Salmson. Her first win seems to have been September’s Gaillon hillclimb, in the Bugatti. She won the 5000cc class. In between these two events, she took part in a gymkhana at Boulogne, and was third in the 2000cc class. The following season, she received delivery of another Bugatti T35C. In this car, she won the Coupe de Bourgogne outright. This was a four-hour road race for sportscars. Jannine set a new lap record, considerably faster than the old one at 132kph. The media at the time were very excited to find this new female star. She also raced in the Grand Prix meeting at Comminges. To begin with, she did not qualify for the final, but another driver dropped out, so she just got in. Unfortunately, she did not finish. Early in the season, she took part in the Argenteuil hillclimb, and was second in the 2000cc class. Another speed event, the Boulogne-sur-Mer trial, gave her another class second. She started the Marne Grand Prix, but her final result is not forthcoming. That year, she ventured out of her homeland for the Spanish Sportscar Grand Prix, too. The result of this race has proved hard to track down, and she may have pulled out of the event. Contemporary press reports suggest that she did not qualify. Back in France, she won the Gometz-le-Chatel hillclimb. She also did some speed trials at Arpajon, and broke the women’s record with a 204kph run. In June, she entered the Bugatti Grand Prix, but it is not clear whether or not she finished. Jannine and the Bugatti are listed as entrants in a series of French and southern European races, but for reasons unknown she withdrew. Late in 1928, in an interview in L’Echo d’Alger, she talked about a visit to Brooklands she made, where she was unimpressed with the reception she got from the other women drivers there. It is not clear whether this was just a spectating visit, or whether she intended to race. 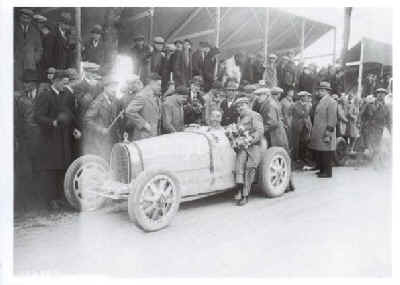 In 1929, the Bourgogne race organisers were keen to have Jannine back to defend her crown, but she did not enter the race. The Bugatti had been sold to Louis Chiron and Foresti in 1928, who used it on the Targa Florio. Newspaper reports from early in 1929 talk of Jannine making a recovery and return to competition, which does suggest that she suffered some illness or injury. There is nothing to suggest that this was due to a racing accident, and almost no other clues to what her problems may have been. Her short career showed a huge amount of promise, and it is a shame that she was unable to prove herself in the bigger races. There are parallels between her career and that of Hellé-Nice: both were theatre performers, both big media draws and both linked romantically with male drivers (Jannine was rumoured to have been Albert Divo’s mistress). Despite Jannine being the better driver, it is Hellé-Nice who is remembered. This blog post will hopefully go some way to adding some balance to their story.